Warm, soft on the inside, crunchy on the outside, salty pretzel dunked in creamy cheese dip. OMG. Is there anything better? Ultimate comfort snack. And I am here for it on the big game day. Truth be told, I don’t really care who wins. Sorry, but I’m here for the commercials, the food and the halftime show. When I was in my 20s, living in Chicago, my girlfriends and I would get together on Super Bowl Sunday and have our very own “Estrogen Bowl.” No boys allowed. We made tons of good food, watched the commercials and talked during the game. I know, super cliche girls. But it was so much fun and some of my favorite memories during that time. I don’t think I ever made Soft Pretzels then, but I definitely should have. These are amazing! These look intimidating, but they are not that hard. I promise. 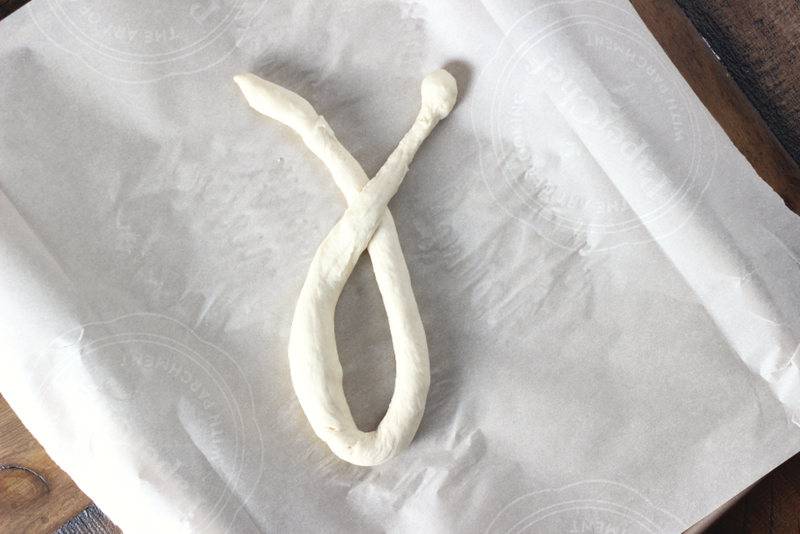 Hopefully you have better skills at twirling the dough to make a perfect pretzel shape. I still need practice. Give these a try and let me know what you think! 1. Whisk the yeast into warm water. Allow to sit for 1 minute. Add in salt, brown sugar and melted butter, whisk together. Slowly add 3 cups of flour, 1 cup at a time. Mix with a wooden spoon (or dough hook attached to stand mixer) until dough is thick. Add 3/4 cup more flour until the dough is no longer sticky. If it is still sticky, add 1/4 - 1/2 cup more, as needed. Poke the dough with your finger - if it bounces back, it is ready to knead. 2. Place the dough onto a floured surface. Knead the dough for about 3 minutes and shape into a ball. Cover lightly with a towel and allow to rest for 10 minutes. Meanwhile get the water and baking soda bath prepared. 3. Preheat oven to 400 degrees. Line 2 baking sheets with parchment paper or Silpat. Set aside. With a sharp knife or pizza cutter, cut dough into 1/3 cup sections. 4. Roll the dough into a 20-22 inch rope. Take the ends and place them together so the dough forms a circle. Twist the ends, then bring them towards yourself and press them down into a pretzel shape. 5. Bring baking soda and 9 cups of water to a boil in a large pot. Drop 1-2 pretzels into the boiling water for 20-30 seconds. No wore than that, otherwise your pretzels will taste like metal. Using a slotted spatula, lift the pretzel out of the water and allow as much of the excess water to drip off. Place pretzel onto prepared baking sheet. Sprinkle each with coarse sea salt. Repeat with remaining pretzels. 6. Bake for 12-15 minutes or until golden brown. Remove from the oven and serve warm if possible.